So on the back of the Tegiwa/JCAL Intake manifold test, the pursuit to find the ultimate spec K20 continues. This time we are testing 70mm TBs and induction/intake modifications to compliment our previous test winner – the Skunk2 Ultra Street (results found here). The location this time was DMS-Performance in Caldicot, South-Wales. 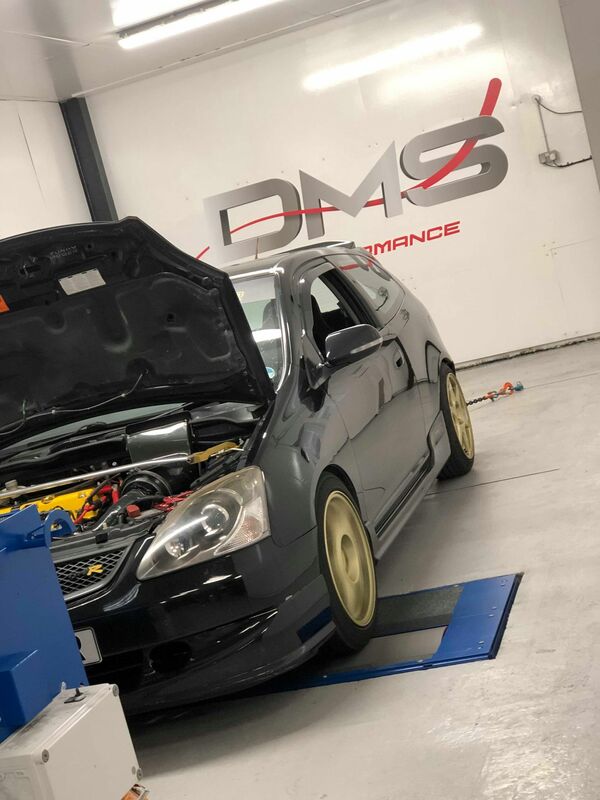 Having recently installed their brand new MAHA dyno, quickly gaining quite the reputation within the Honda community, and being the second home to Jesse @JCAL this was the perfect place for our test. 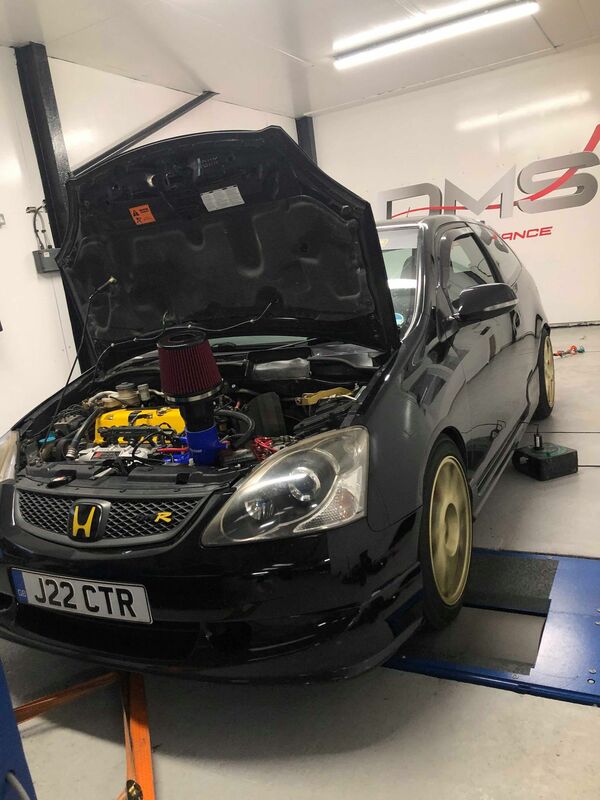 The test car this time is a Honda Civic EP3 that I have tuned here at DMS previously. Mike, the owner, was very kind to allow us the use of his car for the entire day. After a very long nightshift, he even stayed to help out so a big thanks to him. “You the real MVP”! We knew that results where going to be very close so monitoring the conditions, keeping them as fair as possible was going to be paramount. Now it sounds obvious but take a power run from a car with a cold intake manifold (i.e just warmed the engine up ready for a run), it will make a few HP more than the exact same car after a few runs or left to heat-soak the manifold for a bit. So with this in mind we used a pyrometer to gauge the temp of the intake manifold to try and keep as much consistency as possible, intake air temp was taken from the ECU not the dyno. Other factors like ambient temp we are at the mercy of, but they where recorded anyway to help back up our data and it was really close for the most part. 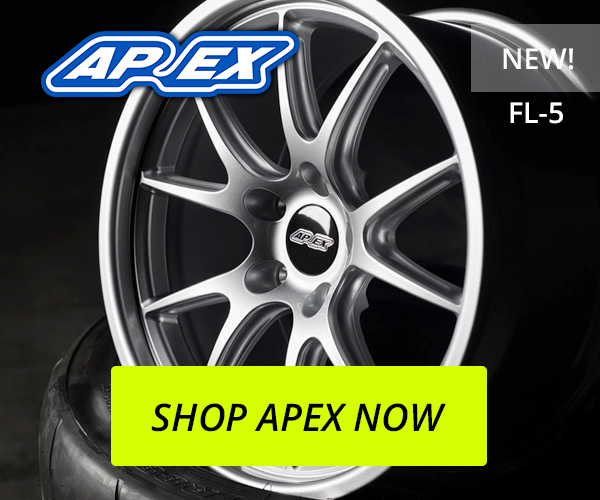 We did order a K&N Typhoon but an issue with delivery meant it didn’t arrive on time. Previous testing I’ve done with the “heat-soaker” type intakes says it would have lost out to all the above anyway. EDITORS NOTE: Jesse has tested these types of intake before, and you can find a brief write up (with example image) HERE. 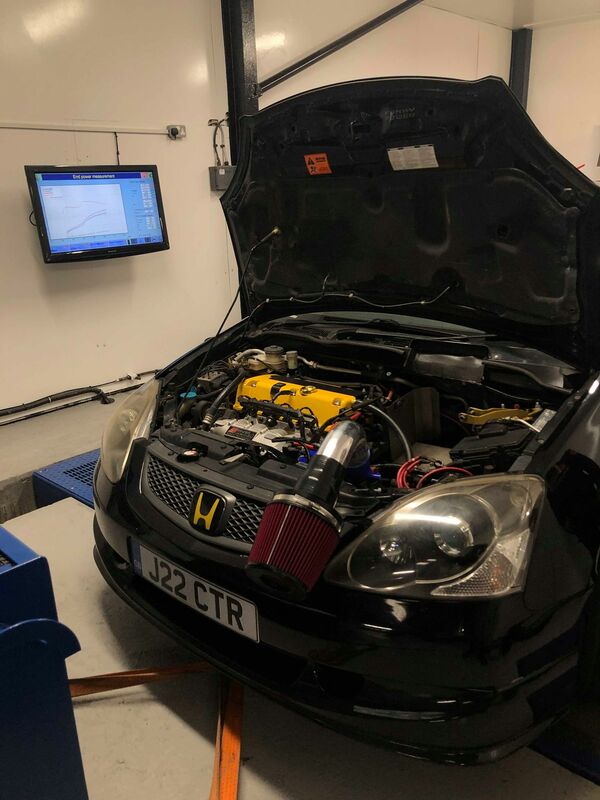 So before we get into swapping induction systems around, we stabilised the temps and figures from the dyno, then we put a Tegiwa 70mm throttle-body on. As expected at this kind of power the 70mm does very little in the way of improving the performance from the engine, 1HP and 1FT/LB’s was the consistent figure difference between the two. 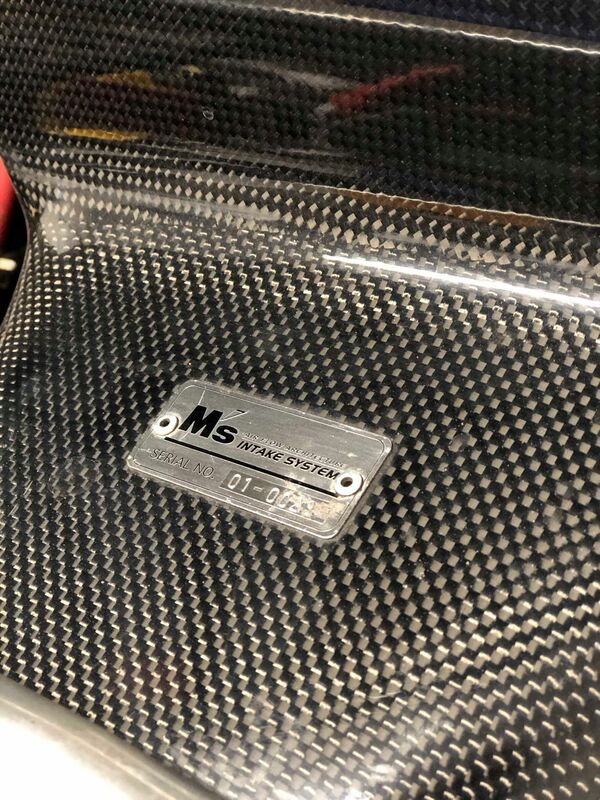 So the Gruppe M carbon intake was the first up, its worth noting that this is the only used intake in this test. How much effect that had I couldn’t say, but Mike did say he cleaned it all out prior to us tuning the car a few weeks before hand. This is a firm favourite with a lot of people and I’ve seen great results on engines with these before hand, so I was expecting to pick up some power over the two air-box intakes although neither of which have a Velocity stack and both having tiny filters. 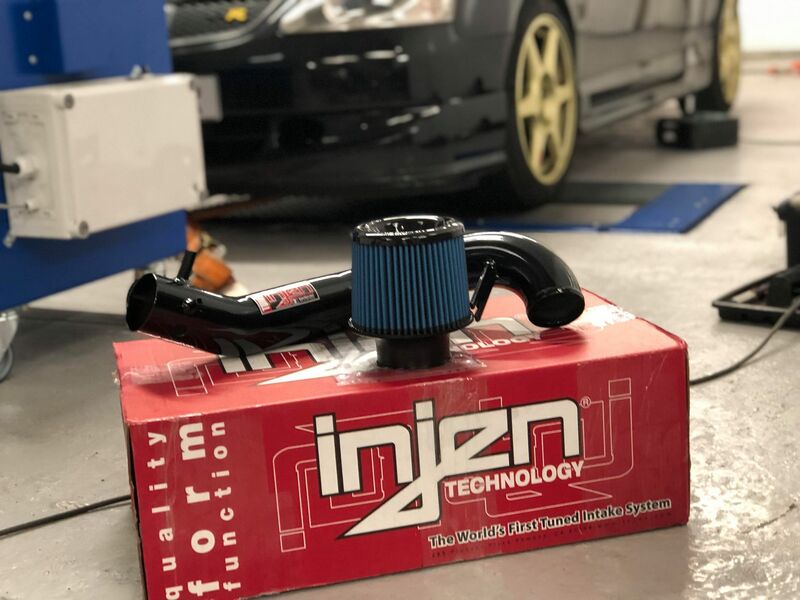 The Injen has both a larger filter and it has a built in velocity stack tucked in behind the bumper, I was also expecting colder intake air temps to play a roll. 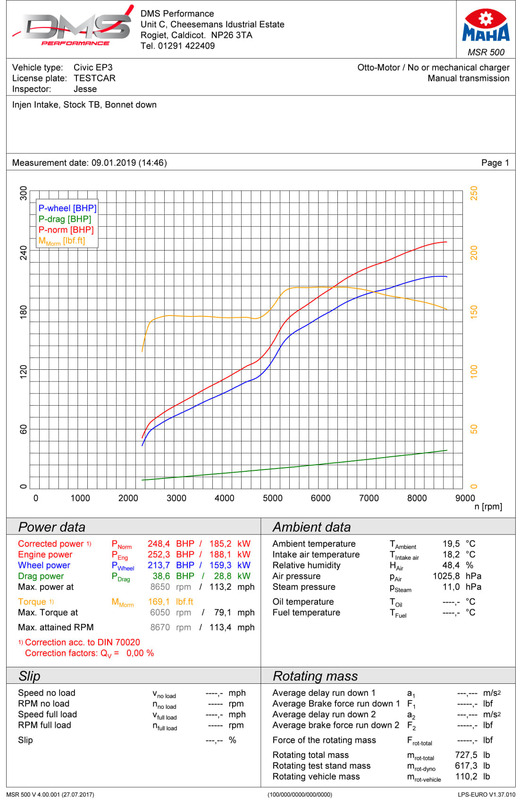 Well I couldn’t have been more wrong, our intake temps were a good few degrees higher than the air-boxes despite having the same ambient air conditions thus suggesting we weren’t getting any air to it. 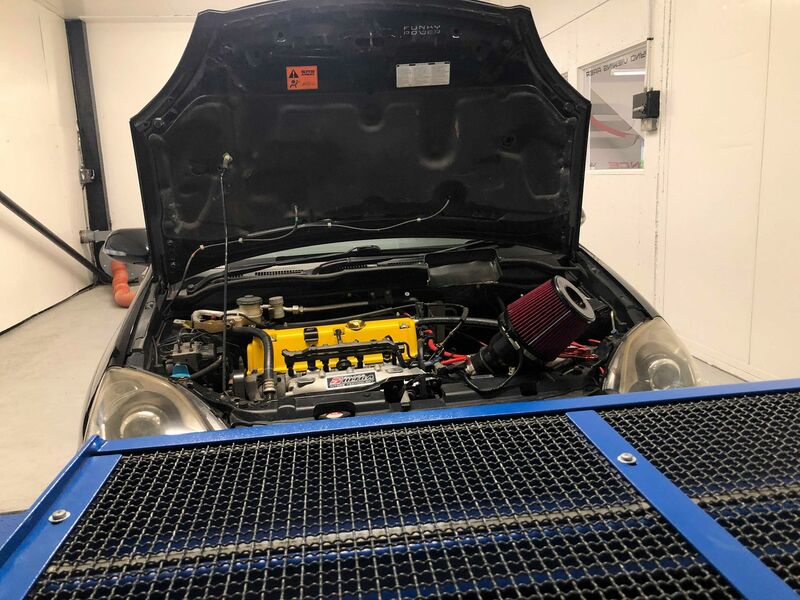 We moved the dyno fan towards the passenger side of the car hoping that a more concentrated airflow over the foglight hole would help bring those temps down… fail, all that happened was the engine got hot due to lack of airflow through the radiator. We must have made at least 7-8 runs on this intake, trying different things with the mapping and the airflow around the car but it just wasn’t having it, VTEC crossover was a little perkier. Skunk2 Velocity Stack Filter Kit…..with JCAL custom length intake pipe/s. This was the interesting part of the test for me personally. 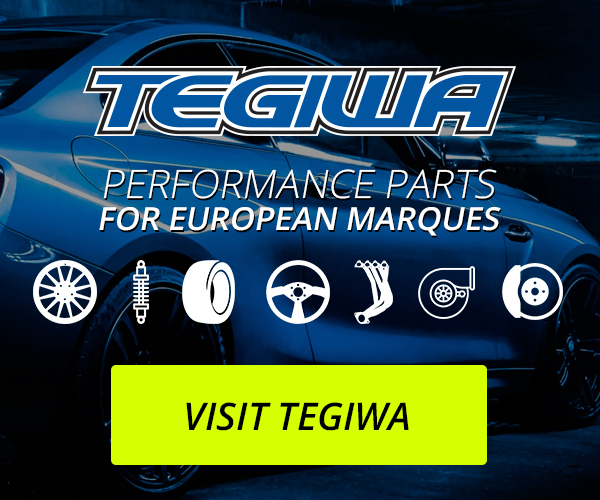 We nearly didn’t run this arrangement as it was a last minute thing, overnight parts from Tegiwa made it possible. I’d already, rather boldly, told Johnny at Tegiwa that my intake pipe design was going to win this test IF my theory proved correct. So a very brief background on the theory. Its widely known that tuning the runner length on any intake manifold/ITBs will generally net an improvement, you’re essentially tuning pulses or ‘waves’ of pressure created by the operation of the engine to match up with a specific RPM range and create more torque/power at that specific range of operation. Now intake, or induction, kits should react the same way. If we could match the pulses/waves being created by the engine and intake manifold arrangement with the pulses/waves from the induction system, we’d see a gain at the RPM range we wanted it for making peak power, high rpm. Armed with the Skunk2 velocity stack filter kit as well as box of spares we got to creating attempt number 1 and as crude as it looked, it was essentially all we needed to get the test under way. We hung the intake out the bonnet purely for ease of testing, this is why we tested each kit with the bonnet up and the bonnet down so as to rule out any gains from having to have the bonnet up with this homemade intake. This part of the test for me was purely about making power at the engine rather than it fitting a specific car, I didn’t know what length intake I was going to need at the time it wasn’t practical to start ripping the car apart to make intakes that may or may not work. Going for a long intake pipe (roughly 81cm from TB exit to tip of velocity stack) I was expecting a gain in peak torque then tapering back down to match the air-boxes at peak power, we made more torque than anything and a touch more power than anything – my theory on point so far. Great start, Now to prove a gain is in the intakes length we cut a length out the intake system and run it again at roughly 48cm… this time I was expecting our peak torque to fall a little over the longer pipe but peak power to carry higher at high rpm. We lost 1FTLB of torque which wasn’t as bad as I was expecting, however the curve did lose out in torque at a few points as it wiggled ever so slightly (barely measurable but they are there), and power carried on strong to make gains over the longer pipe – theory still holds. As you can see, we didn’t lose any peak torque this time which is interesting, we did however make more gains up at high rpm as I predicted. Eagle eyed readers will have noticed that the engine is becoming more powerful at 2000-3000rpm the shorter we make the intake. This may be the intake harmonics matching up at 2 points in the rev range as the pipe becomes short enough to catch it at low RPM as well as at higher rpm. Nearly 10HP over the Injen, an already very good intake. Thats nearly 4% power increase on an already modified 2L NA engine with just an induction system swap. It is worth noting that the lengths and even the diameter we used here may not have been perfect, we tried 3 lengths only due to parts and time restrictions, but I’d have liked to try a size shorter again to be sure no peak power was being wasted. I can’t be sure the perfect length intake for the Skunk2 ultra will be the same for other manifolds either, or even if its manifold specific at all, I need more testing to confirm that.